Quirky Jessi: Grab your pillow case and let's go trick-or-treating! Grab your pillow case and let's go trick-or-treating! No really, the pillowcase. That's the one you should choose and it's even proven. Shown to me by Dave, it's a really neat science experiment about which kind of Halloween trick-or-treating carrier is the most efficient. All the nerdy details are there.....even a breakdown of about how many houses you would need to visit (based on even more nerdy details....there are maps and all)! 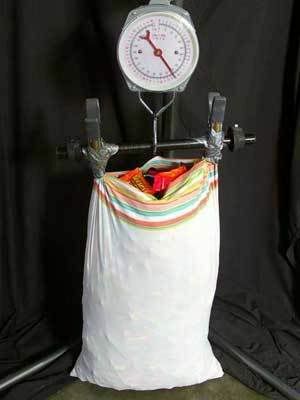 And if you're wondering how much candy is in that bag...that's 47.75 lbs worth or about 1690 pieces!